Kumi arranged a perfect tour of Tokyo for us. She provided excellent itinerary recommendations, selected a delicious local restaurant for lunch, and was very flexible with us when we needed to modify our plans with only a couple days remaining before the tour. Kumi's English and professionalism are impeccable. 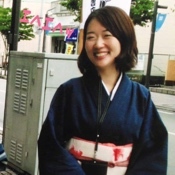 She is warm, welcoming, well organized and well versed in Japan and Asia. We were delighted with our experience and enthusiastically recommend Kumi. TOUR GUIDE RESPONSE: Thank you so much for your review, Meredith!! It was great to be with a lovely couple like you two, and I hope you enjoyed the "fast-food" type of lunch in Japan :) Hope you come over to Japan again as your main destination next time! !